Since building something that's conventional is out of the question for Dubai, the second-largest United Arab Emirates city announced today that it's breaking ground on the world's largest shopping mall. 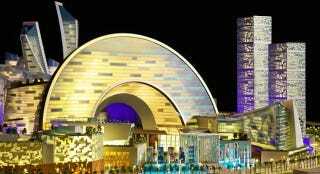 In a grand announcement made by the emirate's ruler Sheikh Mohammed bin Rashid al-Maktoum, "substantial work" has begun on the aptly titled "Mall of the World." However, details such as a targeted completion date, its cost, and where the financing would come from weren't disclosed. Plans for the mega-mall were originally announced 18 months ago. And from what Gulf News reports, it sounds impressive. The eight-million square feet facility will house the world's largest indoor theme park, several theaters, a four-mile long "retail street network," around 100 hotels, and a medical facility if you plan to shop until you drop. For those keeping track at home, the mall is roughly one million square feet bigger than current record-keeper: New South China Mall in city of Dongguan. Also, it's more than two-and-a-half times bigger than our lowly Mall of America.